It’s not that unflattering. I think it’s kind of nice. 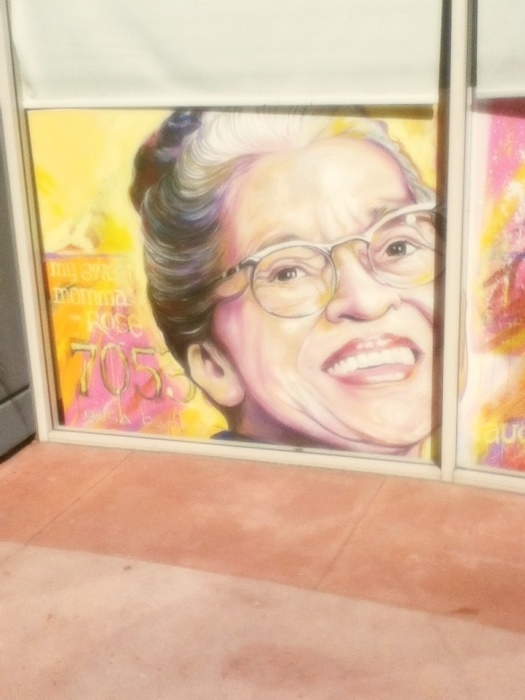 IDK, Rosa Parks didn’t live in the time of HD, let’s remember her, not her pores. Also, it was for sale for $900 at the mall. Yeesh. There a creepy mural by my house of children’s faces. It’s their eyes that freak me out, really. Not that this is overwhelmingly creepy…just not up to par with what Ms. P deserves, amirite? My head’s been ripped from my body! Painted smile of forever. It looks like it should be on the side of an A-team style van. She looks like a sweet granny, not an amazing catalyst for action. Hm…yeah definitely not the most flattering painter. I guess they were trying to go for some kind of serene victorious look…but the close-up on three chins? The artist could have definitely used a better angle.